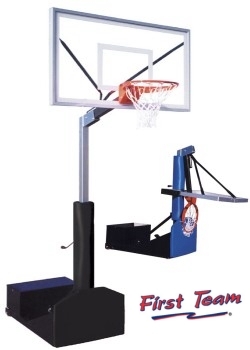 Hand crank height adjustment from 10' to 6'6"
The Rampage portable basketball goal is by far the best performing unit in its class. No other portable goal offers this level of rigidity, portability and simple height adjustment at such an affordable price. Infinite rim height adjustment can be made with the easy crank handle located on the back of the vertical mast. The rim height indicator labels determine rim heights from 10' to 6'6". The Rampage uses our exclusive crank-up design, which is far superior to similar goals using "spring-slide" methods. The Rampage can easily be transported across a gym floor or up a driveway. Simply depress the foot lever located on the base unit for transport. Flip the lever back up for play. The extension arm drops down easily without tools to allow the Rampage to pass under doorways for storage rooms or garages. The backboard to base extension is 30" at all rim heights. The front base extension is 30" at all rim heights. The front base and stem are covered with thick vinyl padding for player safety. Padding is available in several choices of colors. BALLAST NOT INCLUDED: This system requires a recommended 300 lbs of ballast.